SASKATOON, SK (January 20, 2017) – Exclusive Autosport will make their Cooper Tires USF2000 Championship Powered by Mazda debut in St. Petersburg when the first rung of the Mazda Road to Indy Presented by Cooper Tires gets underway in early-March. Team owners Michael and Kimberly Duncalfe are thrilled to announce their first driver for the 2017 season – fellow Canadian Parker Thompson. The team will head into the season with a true shot at the title with the reigning USF2000 Championship points runner-up primed and ready to pilot the team’s #90 Tatuus USF-17. The young Canadian driver is excited to be returning to the series, having enjoyed a successful test with the squad at Sebring last week. “I am absolutely thrilled that Exclusive Autosport will make its series debut in the MRTI in the Cooper Tires USF2000 Championship Powered by Mazda,” offered Michael Duncalfe, Exclusive Autosport Team Owner. “It couldn’t come at a better time for EA as we have completed our fourth season as a team, where we have captured 11 team championships and four Rookie of the Year championships. We felt it was the right time to move up to the next level, especially with the introduction of the USF-17 Tatuus chassis. Dan Andersen and the staff at Andersen Promotions run a top shelf program and it is an honour to have my team competing on this platform. The team is making a calculated move into the Mazda Road to Indy Presented by Cooper Tires this season. With multiple championships on their resume in Canadian and American Formula 1600 racing, including SCCA, Formula Tour and Ontario F1600 competition, winning is expected and is the ultimate target. Exclusive’s USF2000 program will base its operation in Palmetto, Florida and will be managed by 2015 USF2000 Mechanic of the Year Jay Green. In addition to Jay, EA will have their loyal full-time mechanics on the program. The current plan is to run three cars in 2017. After having purchased two cars in the initial buy-in opportunity, Duncalfe has already added a third car to the stable. The 2017 season will not be the first time that Thompson has piloted an Exclusive Autosport entry. The 18-year-old from Red Deer, Alberta raced for the team in their Spectrum FF in the Formula Tour F1600 series in 2015, sweeping a weekend at Circuit ICAR in Mirabel, Quebec. He proceeded to qualify on the pole at the famed Le Circuit Mt. Tremblant the following week. The previous relationship helped make this new partnership a natural fit, heading into the new year of competition. “This was easily one of the hardest off seasons I have had in my motorsport career thus far,” Thompson admitted. “I honestly didn’t know if I was going to get behind the wheel of a racecar in 2017, so when the opportunity arose to become a part of the EA organization, I was ecstatic. The team will be back testing at the end of the month at Homestead-Miami Speedway. Drivers interested in discussing EA’s remaining seats are asked to contact Michael Duncalfe direct by calling the office at 306-242-8284. 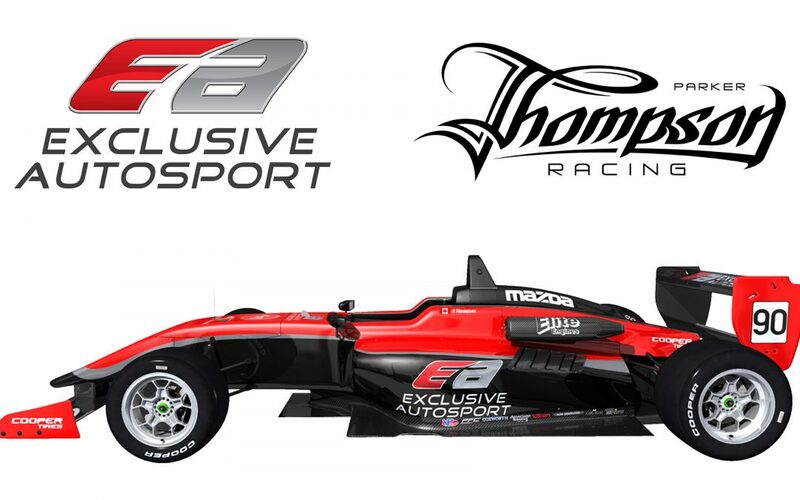 Exclusive Autosport (EA) is a professional racing team dedicated to the success of its drivers in open wheel formula car competition in North America. EA operate teams in the Cooper Tires USF2000 Championship Powered by Mazda in the United States and the Formula Tour 1600 series in Canada. Exclusive’s drivers have secured numerous race wins, podium finishes and pole positions, as well as Rookie of the Year championships, a Team USA Scholarship and nominations for Team Canada F1600. Exclusive’s drivers are on the podium in over 80% of the races they enter. Exclusive Management Inc., the team’s parent company, has enjoyed great success in both open wheel and sports car racing and has worked with standout drivers like Thomas McGregor, Jack Mitchell Jr., Shelby Blackstock, Gregory Liefooghe, Jayson Clunie, David Levine and Trenton Estep. EM Inc. drivers are highly sought after in the motorsports industry.